Salt Baths | Temp-Rite Steel Treating, Inc. In our salt department, parts to be treated are suspended in a molton, neutral salt bath. Suspending a molten neutral salt bath helps minimize distortion. Once fully austenized, the work is then quenched in either oil, water, brine, or a thermo-quenching medium (also known as mar quenching). Temp-Rite Steel Treating provides a full line of neutral salt bath hardening. 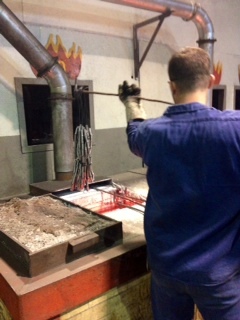 After quenching, parts are then cleaned and tempered down to their desired rockwell. Temp-Rite Steel Treating maintains a salt bath area for hardening and tempering operations. The area is arranged to expedite maximum production flow of industrial parts.